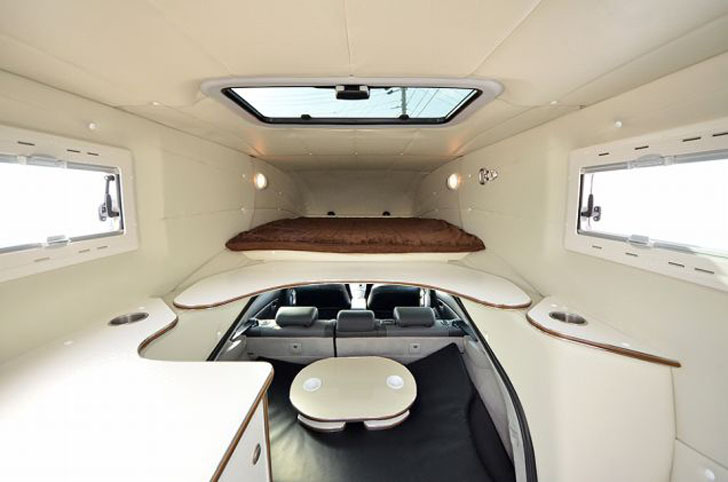 While the Prius may have sparked a lot of bad car jokes, we think you’ll find that the Relax Cabin from Japanese conversion maker, Camp Inn, is 100% up to snuff when it comes to sleek, modern RVs that sleep 4. 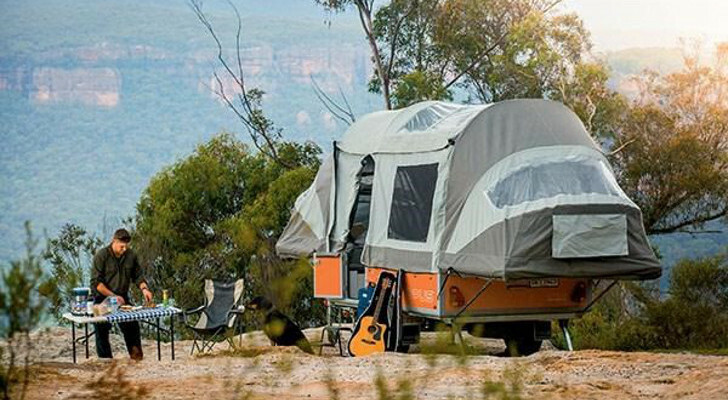 The slightly humorous side profile not withstanding, it’s a great example of a modern RV conversion. 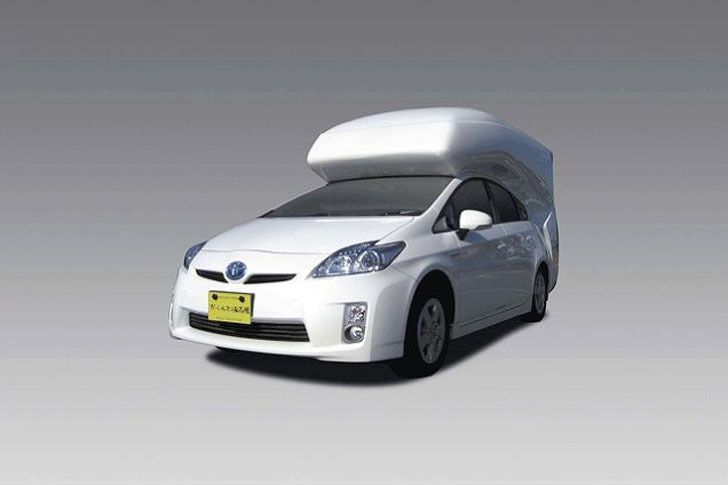 Sleek and modern, the Prius Relax Cabin. 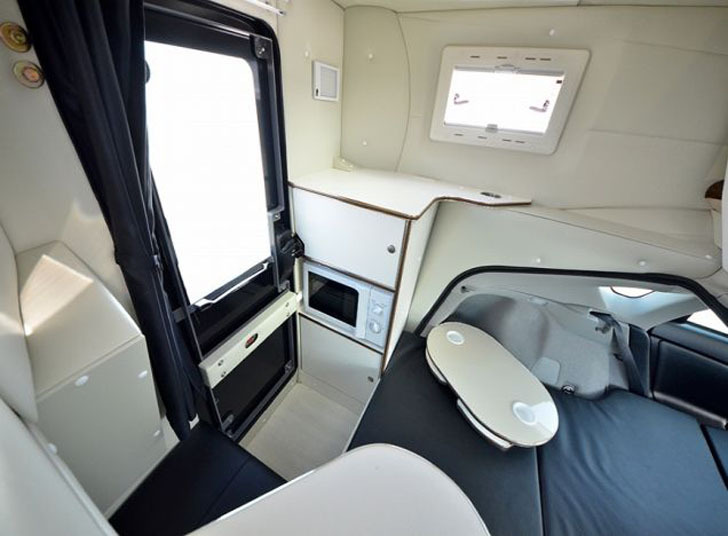 The lower cabin has a double bed extending back from right behind the front seats. The upper berth is cantilevered out above the driver’s head to make use of the added upper space. 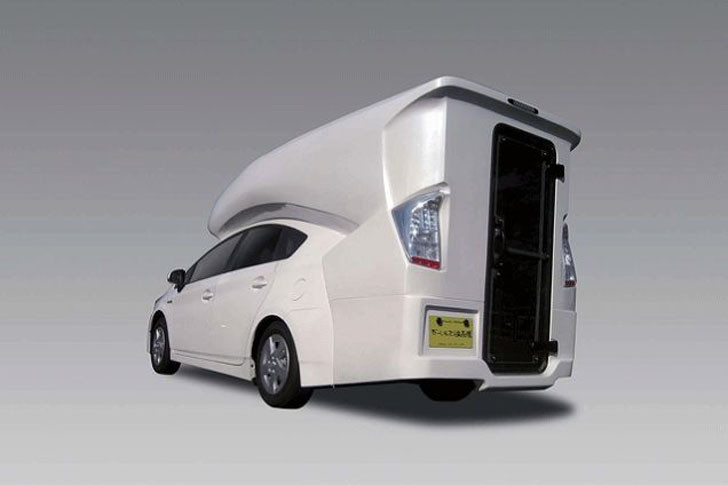 The design starts with a basic Prius. The rear seats of the Prius fold down to form the lower berth. In their upright position, they still provide adequate seating for two adults. Just behind the upper sleeping area is a vented skylight and two long, rectangular casement style windows that add light and fresh air into the cramped quarters. The car’s windows, along with a glass back door, allow the sun to bathe the entire space in light. 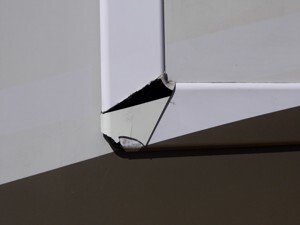 The lines are curved, with an ergonomic feel that makes the space seem more comfortable than your typical, angular RV. Side windows and a translucent back door let in lots of natural light. 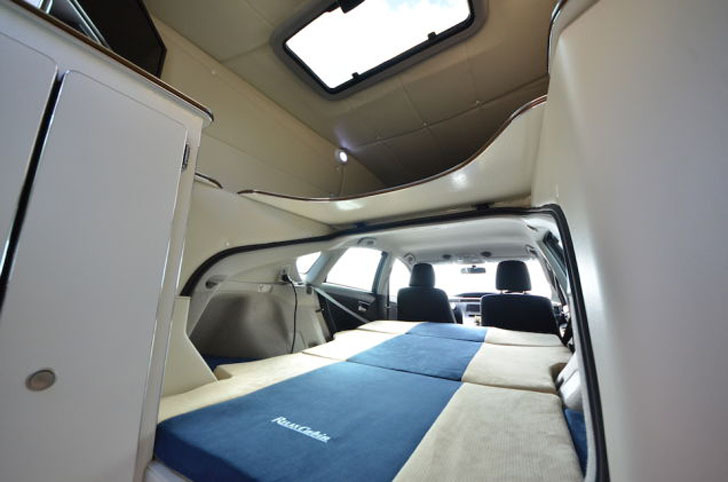 The interior space is enormous, considering they have added only 20 inches to the Prius’ original length. And the inside height is 7 ½ feet (the height of a standard house door frame) so that even us 6 footers can navigate it. A full height rear door makes for easy access. 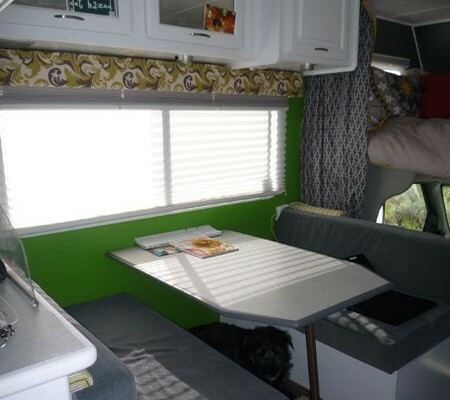 The kitchenette and dinette are scaled down to fit the space, but seem serviceable. 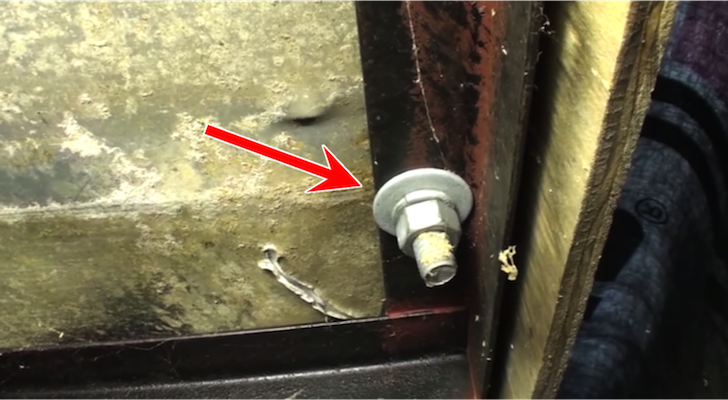 It’s not until you view the upper berth that you find anything remotely “hobbit hole” about this hybrid customization. 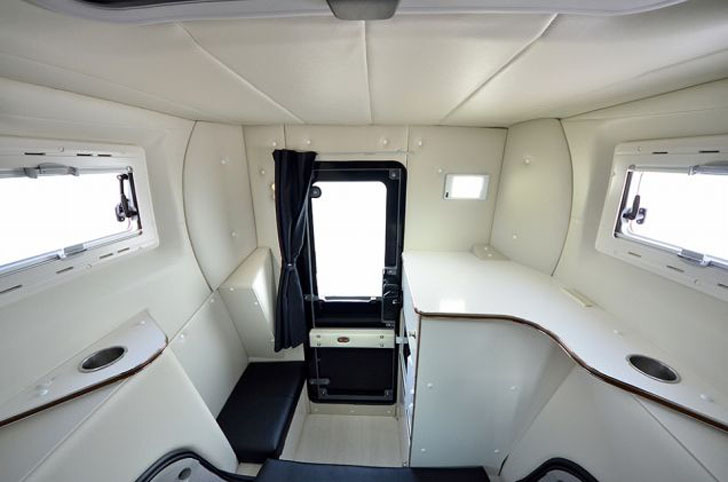 The upper berth is similar to those found on boats, or in pickup campers. 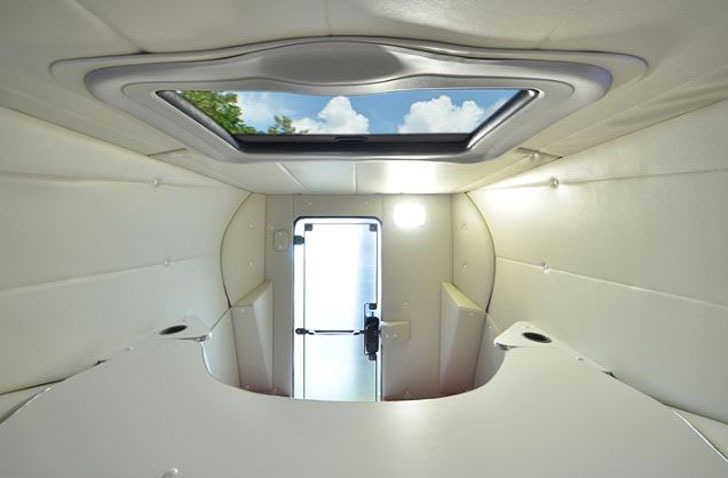 The upper berth extends over the Prius cabin. 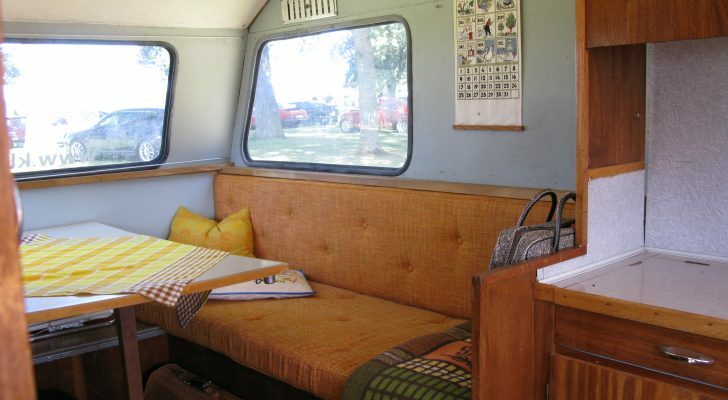 The beds in the lower berth can be folded into a couch to make room for a small dinette table. 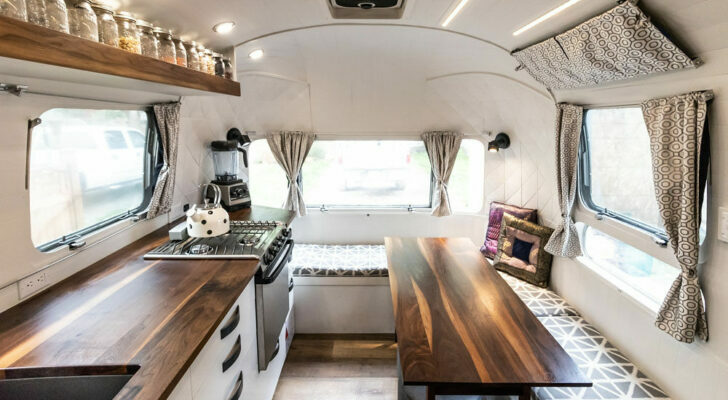 There are optional add-ons that can be had as well, such as a sink for longer term camping. Lower bunk folded out to sleeping position. 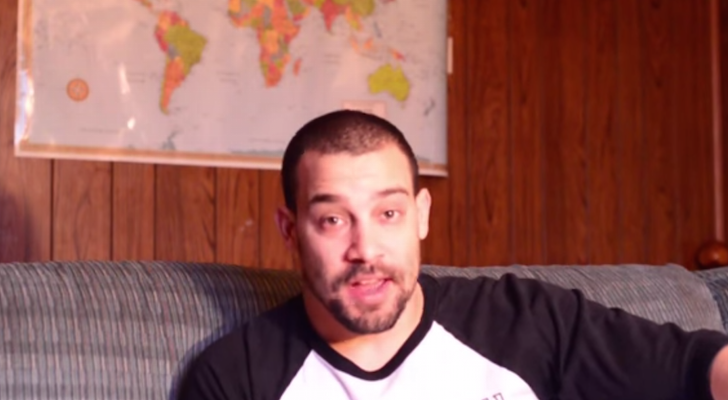 So, let’s talk price. You know you want one, but you better have been saving or working on your credit, because the baseline for the converted car is $36,000! Just having the conversion done to an existing Prius will run you about $20,000. Microwave mounted inside rear door in this model. 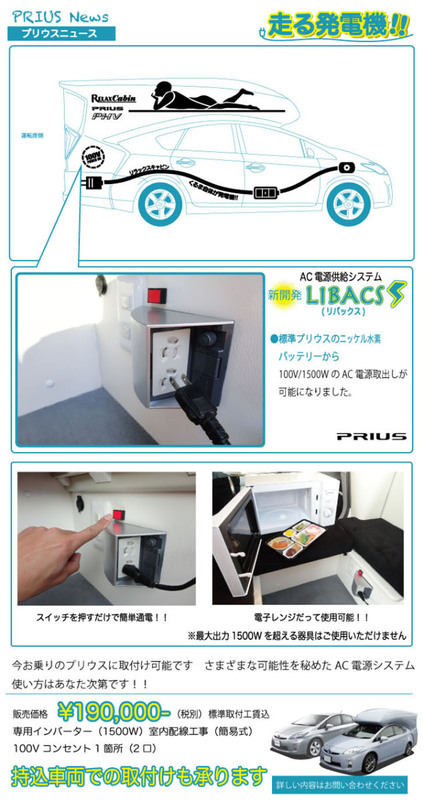 Since the Prius already plays host to a huge rechargeable battery bank, the fridge and microwave easily run off of it at 100 volts. Recharging electronic gadgets or supplying power is simply a matter of plugging into a standard outlet. Standard electrical outlets allow accessories to tap into the car’s battery bank. The electrical system also has additional plugs for any “accessories” you might care to bring along. Just plug them via standard Edison 110 volt style plugs for easy, direct current power.